Our Lady of Good Counsel Parish, located in Bangor, Pennsylvania, celebrated a milestone of serving God’s people in the Slate Belt area for 100 years. 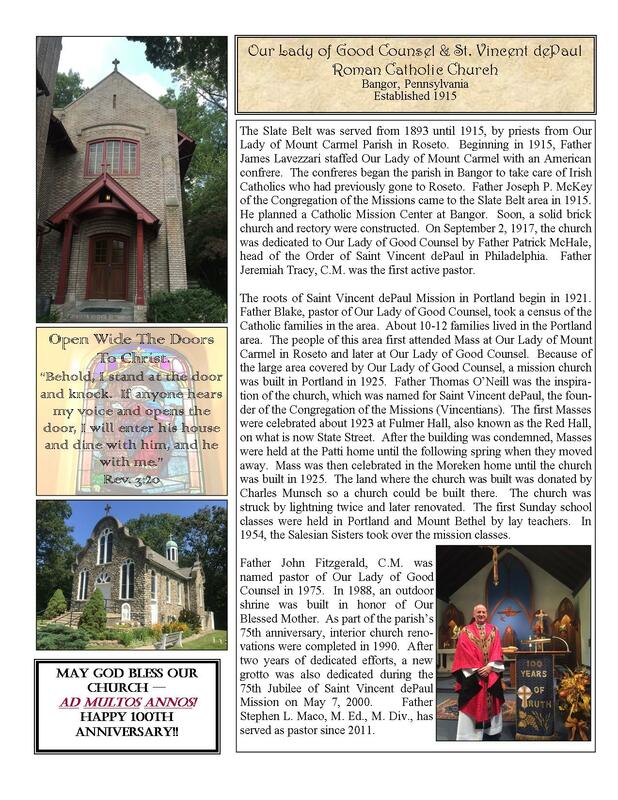 Our mission church, St. Vincent dePaul, located in Portland, Pennsylvania, is celebrating 90 years of serving our faith community, as well. Father Stephen L. Maco, who has been pastor of the parish for four years, looked forward to our centennial celebration, in having the honor of Bishop John O. Barres as main celebrant of the Centennial Mass along with local clergy. The church patron is Our Lady of Good Counsel. The image of Our Lady, holding the Divine Child in her arms is painted on a piece of fresco about 18 inches square. According to legend, this fragile piece of plaster stands suspended in mid-air, without worldly support. It has been held in place for over 400 years by the invisible and omnipotent hand of God. The picture itself still remains unfaded. To this day, it remains in the little town of Gennazzano about 16 miles outside of Rome. It is a beautiful old church under the care of the Augustinian Fathers. In 1914, the Vincentian Congregation of Philadelphia sent Father Joseph McKey to assess the needs of the English speaking Catholics in the Slate Belt region. Father McKey began celebrating Mass in an old Jewish clothing store. Bangor was to be the trunk of an English speaking mission from which branches at Pen Argyl, Wind Gap, West Bangor, Martins Creek and Portland were to grow. Soon after the congregation wanted a permanent church and started a building fund. None were so tireless in fundraising as Bridget Shannahan and her four children. She traveled on foot over 100 miles to raise $700.00 for this project. Bridget always said she would never see the fruits of her work and unfortunately, she never did. Mrs. Shannahan passed away before the project was completed. Father McKey secured a property on South Second Street in Bangor, under the intercession of Mary’s Miraculous Medal. The beginning of Our Lady of Good Counsel Parish, started on August 1, 1915, with the dedication of the land by Archbishop Edmond Prendergast of Philadelphia. The name originally was St. Vincent’s but was changed to Our Lady of Good Counsel, by the Vincentian Fathers also known as the Congregation of the Missions. Construction began in 1915 and many men from the quarries came to build the foundation of the church. The church was dedicated on September 2, 1918, with an attendance of 1,000 people from all over Eastern Pennsylvania. The first Mass was celebrated by its founder Father Joseph McKey. Though Father McKey was founder of the church, the first pastor was Father Jeremiah Tracey, followed by 15 Pastors including our current pastor, Rev. Stephen L. Maco, M.Ed., M.Div. In 1921, the pastor at the time, Father Blake, saw a need for a church in Portland. Reverend Thomas O’Neill was the inspiration of the church in Portland and named it for St. Vincent dePaul, founder of the Congregation of the Missions. Father Blake realized people were walking over 10 miles to Bangor to attend Mass. The first Mass was celebrated in 1923 on State Street at Fulmer Hall. Masses were said at the Moreken Home just past the toll bridge in Portland, and other various places including other parishioner’s homes. Mr. Charles Munsch, donated the land for the church and the cemetery. The cemetery was cleared of stones and these stones along with field stones from local farms were used in the construction of the church. Father Francis Hinton was the Pastor of Our Lady of Good Counsel during the construction of St. Vincent DePaul; his parents paid off the final debt of $7,000.00. Many local families were involved in the building of the church; some of the family names were Moreken, Patti, Taylor, Manzi and Merlo, to name a few. The first Sunday school classes were held at the Michael Moreken house in Portland. A second class studied at the John D. Taylor house in Mount Bethel. The classes were taught by Mary Moreken and Juliette Taylor from 1939-1954. Fanny Merlo, taught the classes in the church. In 1954, the Salesian Sisters undertook the educational mission. Father Henry Young was named pastor on July 25, 1939. During his pastorship many improvements and repairs were done. Both churches were refitted with all new interiors, vestments and vessels; a new dance class, play group and drum corp was founded. In 1944, the budget for the church was $2,730.99. Currently we are proud to say that Our Lady of Good Counsel and St. Vincent dePaul Parish, is active in church activities such as the Holy Name Society, the Blessed Virgin Mary Women’s Guild, the Choir, Scripture study, home visitation of the sick and the Cenacle of Divine Mercy. More spiritual development is being planned for retreats and Days of Prayer and Reflection. While ours is a proud past, the parish must look ahead. A Jubilee celebration is a time to pause and to evaluate the future of our parish. May Mary, the Mother of Good Counsel draw us closer as we exit our 100th year. May Mary bring us to remain a Christ-centered parish, marked by spiritual growth and harmony, while always guided by the teachings of her Son, Jesus Christ and His gospel mandate, to love one another as I have loved you!